How we’re doing TFOJB for 2016. Bring TFOJB to your town! 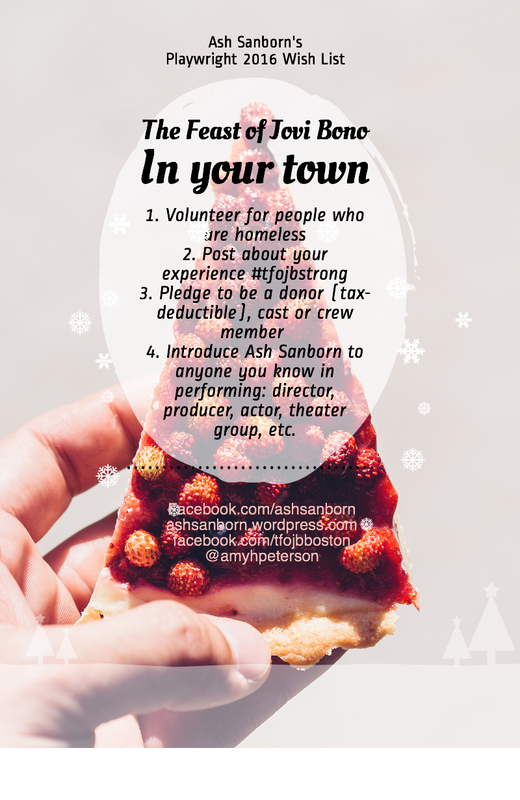 Help to make it the next Fantasticks with an audience, cast and crew revolution! First, you go out and make a difference for others and in yourself, then be part of it. To people already in the trenches working on the issue of homelessness: I’m out attempting to raise volunteers for you, who will be audience, cast and crew of my play. We’re taking a theatrical approach (collaboration, group bonding, taking on the issue of social isolation) and hope to be a perennial theater performance so we can bring in people actually doing something about homelessness over a long period of time. What can we rock together?